A picturesque 4 star boutique Margaret River hotel with ten spacious spa suites nestled amongst towering Karri trees only 10 minutes walk to town. 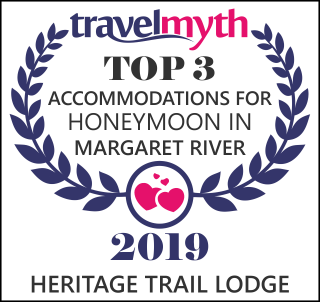 The Heritage Trail Lodge is ideally situated accommodation on the edge of the beautiful Bramley Forest overlooking the towering Karri trees and abundant birdlife of the National Park and surrounded by a lush manicured garden landscape. This ideally located forest retreat is only 400 metres from Margaret River Township with its numerous restaurants, cafes and galleries. 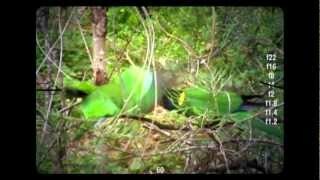 "To wake up with the view of the forest and the sounds of the birds is the best therapy anyone can dream of. Great location and just far enough out of town (10 minute walk) to be easy to get to. Very quiet, peaceful property. Close to trees and nature in general. Just what my wife and I were wanting. Great sized rooms and excellent service throughout." Welcome to the perfect 4 star Margaret River experience. See for yourself the lush gardens, luxurious suites and stunning natural surrounds that make Heritage Trail Lodge so unique. Discover some of the many exciting attractions in the remarkable Margaret River Region. Wake up each morning to the sounds of nature and a delicious complimentary buffet continental breakfast of local produce served in our cosy conservatory. Wander through the lush, manicured gardens and trickling water features, delighting in the antics of the many native birds. Relax on your private balcony with a glass of Margaret River wine taking in the sights and sounds of the forest, and then unwind in the huge 2 person spa. “Beautiful Setting, large room & awesome breakfast. The lodge itself is in a perfect location only 300m from the town of Margaret River, with a lively pub next door there is a place to eat and drink on your doorstep with no need to drive! The room was large and cool with a fantastic bathroom complete with large spa bath and separate shower. There is a fridge and a cupboard with glasses, knives, cheese board etc which is everything you could need... also the added bonus of a large Smart TV with access to Foxtel and all modern streaming apps. The grounds the loge sit on are beautifully maintained with the feeling of being in the middle of the forest! Breakfast was very substantial with fresh fruits and local yogurt, cheeses, a selection of breads and sweet treats which filled us up for the day and we didn't miss eggs at all! We would definitely recommend and stay again if we got the chance." Enjoy leisurely strolls through the tranquil Margaret River Karri forest and adjoining Margaret River walking trails. The Margaret River Heritage Trail winds through the stunning Bramley Karri forest following the route of the Margaret River historical logging railway. The many other Margaret River Walk and Cycle Trails can also be accessed from the hotel to provide hours of magnificent hiking or cycling experiences for the adventurous guest. From the Lodge it is a short drive to the celebrated wineries, beaches and caves the South-west region is renowned for. Eco aware, the Heritage Trail Lodge Margaret River has been awarded Green Star Accreditation for its environmentally friendly practices.